Getting those weekend jitters? If you're thinking of a way to quickly dissappear from Bangalore's hullabaloo and go into a much peaceful town, then head to Channapatna right away! Located just about 70 km, which takes roughly 2 hours to complete, Channapatna is a rural area found on the outskirts of Bangalore. Channapatna is famous for selling wooden toys, which are fashionable and have a very smooth finishing touch, perfect for kids to play with. Apart from toys, Channapatna is also well known for its coconut products and raw silk. All these can be bought for the best price, making it the perfect outing for shopaholics! Apart from these articles, Channapatna is almost like a small pilgrimage with a number of temples to visit. If you take the route 3, a diversion of about 5 km from the NICE Ring Road on NH 48 will take you to one of Bangalore's hideout, the Turahalli Forest. The only surviving forest of Bangalore, is ideal to have a walk with your family or even a small picnic. This forest also offers birdwatching so make sure to pack a pair of binoculars if you plan to go. Another 5 km from Turahalli Forest will take you to the famous Omkar Hills. The serene hills houses two temples, Matsyanarayana and Dwadasha Jyothirlinga temple. Being one of the highest point in Bangalore, the Omkar Hills has a gigantic clock tower, which is supposed to be the second largest in the world! Go-Karting and bowling at Grips is the first activity that you can do once you get to Mysore Road. It is open from 10.30 AM to 6.30 PM and offers two types of karts for reasonable prices. Kid kart is for Rs 160 and twin kart is for Rs 190 for 6 laps each. If you have no previous experience with go-karting, they allow a person's assistance. A major tourist hotspot which is the "Dodda Alada Mara", literally translates to the Big Banyan Tree, is about 7 km from the Kumbalgod junction on Mysore Road (NH 275), found on the right. The tree is almost 4,000 years old and stretches across 3 acres of land! There are thousands of aerial roots hanging from the original tree. Over a decade ago its roots caught some natural disease, due to which these aerial roots have branched out to look like many other trees. It happens to be Karnataka's largest and India's second largest tree. Ramohalli, which is about 3 km from the Big Banyan Tree, houses the world's largest monolithic statue of Lord Naga. The statue is about 16 feet tall and weighs almost 36 tonnes! It is a complex of various other temples and shrines. Shri Karya Siddhi Vinayaka Temple is another temple on the left, with a monolithic idol of Shakthi Dhara Subrahmanya, which is 21 feet tall and weighs 56 tonnes. A little ahead from the Kumbalgod junction, you will find a checkpost on the right. Located about 13 km from this checkpost, is the scenic Manchinbele Dam, built on the River Arkavathi. A short trek to the top of the hill will give you an extremely beautiful view of the River Arkavathi surrounded with lush greenery. You can also view the Savandurga hills from the top. Bidadi is a standard stop for people going on long drives for it has a 24x7 coffee shop where you can find many fellow travellers sipping on a hot coffee. It is also famous for having the best thatte idlis! 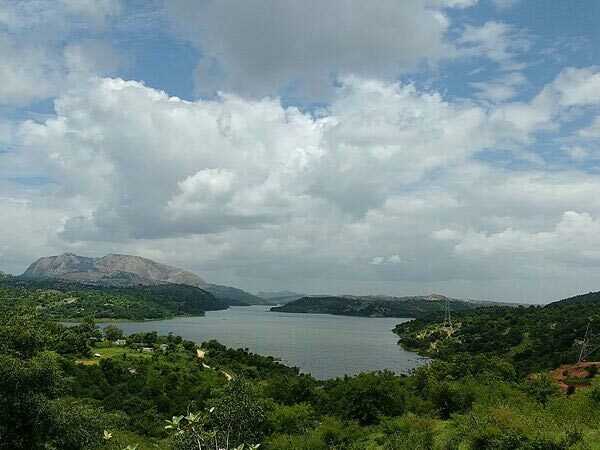 You may also visit the Hagdagari lake around Bidadi. About 9 km away from Bidadi, you can find the city's favourite Wonderla Amusement Park. Although it takes an entire day to visit Wonderla, there are resorts and services if you wish to stay for a day. Seven km to the left of Bidadi is another popular fun-filled spot, the Innovative Film City. People of all ages can spend time at this movie studio and amusement park where you can view various places like cartoon city, dino park and even the sets of the famous TV reality show, Bigg Boss! This land of seven hills, is famous for having the best silk and weaves. There are a number of activities available in Ramangar such as birdwatching, rock climbing, camping and trekking. You can visit the Kalikamba temple that is situated right at the beginning of Ramanagar. Another interesting activity to do at Ramanagar is to go for a wine tour and barefoot stomping of grapes. You can also enjoy wine tasting along with your friends while you're at it. Here are the places you can visit around Channapatna. This man-made reservoir was built on the Kanva river back in 1946. It is a very famous tourist spot and is particularly beautiful during the monsoons as the lake is filled. This is also another paradise for birdwatchers. If you're lucky, you will also be able to spot some flocks of migratory birds. Some 3 km away from Channapatna lies Arameya Swamy Temple of Mallur. The most intriguing fact about this temple is the crawling idol (ambegalu Krishna) of Lord Krishna. It is supposed to be one of the rarest idol form of Lord Krishna. The famous dolls sold in Channapatna are found in Bettada Thimmappa. It is situated about 13 km away from Channapatna. The place has a religious significance as it houses the Bettada Thimmappa temple, made for Lord Vishnu.